The weather on Thursday will be mostly cloudy nationwide in Korea, while the southern part of the country and Jeju Island are set to receive heavy rain. 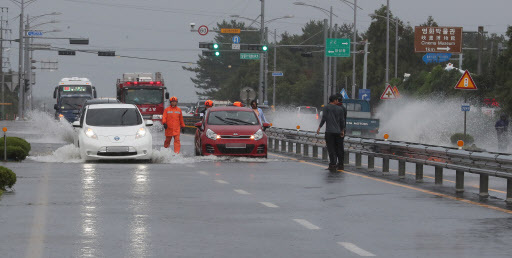 According to the Korea Meteorological Administration, Jeju and coastal areas in the Honam region will receive more than 120 millimeters of rain until Friday. About 5 to 20 mm of rain will fall in South Jeolla and South Gyeongsang provinces, and less than 5 mm of rain will scatter across North Jeolla and North Gyeongsang provinces on Thursday. Beginning from early Friday, the rain will expand to upper areas of the country. Temperatures in southern regions will fall due to the rain. Central areas including Seoul will see a big temperature range between daytime and nighttime, as temperatures plummet to 14 to 21 degrees Celsius in the morning and rise to 23 to 29 C in the afternoon.